Well now. This is how it’s done, isn’t it? My expectations were high for the launch of this title, and the reasons are palpable. Ed Brubaker writing? Check. Steve McNiven on art? Oh yes, that’s a big check. A Steve Rogers, Sharon Carter, Nick Fury, and Dum Dum Dugan cast? Here’s my $3.99, guys—sign me the heck up. I became a Cap fan from reading various Avengers books over the years, but it wasn’t until very recently that I actually began to pay attention to his solo title(s). The praise drummed up for Brubaker’s take on Steve and Bucky got me to give his stuff a look, and from what I’ve read so far, I can confidently say that praise is well-deserved. So I went into this new first issue expecting Brubaker to deliver, and deliver he did. If you’re reading Fear Itself, or even if you’re not, you likely know by now that my sweet Bucky Barnes is dead (again). The setup has, I’m told, been long coming for Cap to take up the shield once again, and here we have that promise fulfilled. The book begins, sadly, with a funeral—Peggy Carter’s, specifically—in an opening scene that is both poignant and purposeful. We’re introduced to the cast, given a brief insight into the man that Steve Rogers is, and then kicked off into an action sequence that, I have to say, is delivered frigging beautifully by McNiven. Can that man draw the heck out of a comic, or what? The layouts are so clear; his lines are clean, and everything just looks fantastic while functioning superbly. You’re certainly never left looking at a panel and wondering what’s happening. I fell in love with McNiven’s work with his Civil War stuff, and I’m falling harder now. But back to the writing. 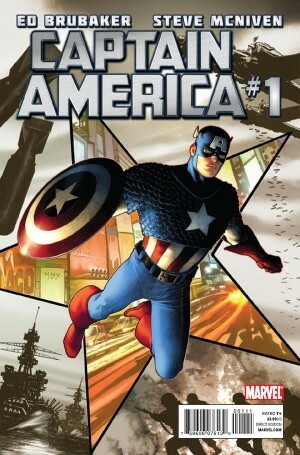 To start off the first arc, Cap and his team find themselves facing a once-friend, now-enemy from his WWII days. Brubaker impresses me pretty effortlessly here. He doesn’t try too hard and he’s never too in-your-face with things. Characterization comes across subtly and naturally, and the setting flows from one scene to another bridged through flashbacks in time. The issue ends with the expected cliffhanger—I say “expected,” but that doesn’t make it any less effective. In fact, I’m even more excited to read on. Marvel, obviously, are capitalizing on the newly-released Captain America movie and using it as a way to give new readers a place to start. I’m shocked to say they’re actually doing it right by writing Cap as he’s meant to be written and not dumbing things down for new fans. Captain America #1 is precisely what I want from a comic, and so long as this creative teams sticks around, I anticipate fans will, too. I tend to pick up Avengers books here and there, depending on story arc and previews that grab me. Bendis as a writer is very hit-and-miss for me. I generally like most of his ideas and character development, but sometimes he’ll do something that will totally stick me the wrong way (treatment of Tigra; last-minute ditch of Spider-Woman title; gag-inducing self promotion in his books), and the stereotype that he writes every character’s dialogue the same is mostly true. Don’t get me wrong—sometimes he is just a master at light-heartedness and at getting down to who a character is through dialogue—but a lot of the time, yes, they do all quip like Spider-Man. Those pet peeves aside, he can still spin a good yarn. Particularly when you compare his stuff to some of the other junk that saturates the Marvel shelves. But I digress. Let’s talk about New Avengers #14. Reading the Avengers off and on as I do can get understandably confusing as I attempt to fill in the gaps of things I’ve missed. What led me to snag this issue was actually a preview page online of Mockingbird talking at the “camera.” Apparently, in the last arc, Mockingbird was gravely injured, and in an attempt to save her life, some sort of amalgam of Super Soldier Serum was administered to her. This summary of backstory is part of why I loved this issue. Instead of reading some dry re-cap page, I got everything I needed to know in-story, directly from the character herself. We’ve seen these pages a lot recently in Avengers—simple, square panel, face-forward shots of characters speaking straight to the audience—and it’s a technique that works spectacularly well. It’s simple, effective, and refreshing. Chris Bachalo and JR Jr. have both tried their hand at this style of storytelling for Bendis, and in this issue of New Avengers, Mike Deodato gets his turn. He does a great job, in my opinion. I loved Deodato’s work to kick off the Secret Avengers title, but soon got sick of the constant shadows and darkness and what became a blatantly obvious laziness. The stuff he does here, though, looks infinitely better—partly because, yeah, he does actually draw their faces for a change—and it feels like he’s trying harder. There’s more going on, and I largely enjoyed it. Mockingbird is indeed the spotlight of this issue, and I’m glad of it. 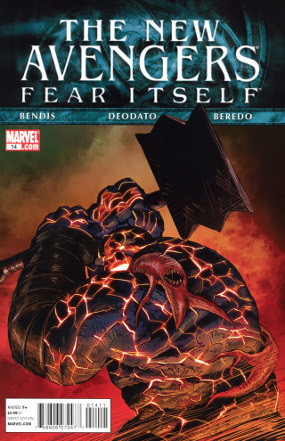 It feels like Bendis is giving her character some real credit, and he ties the story into Fear Itself without actually making it a Fear Itself tie-in … if that makes any sense. The whole Sin/hammers/destruction stuff is still there, sure, but this issue is about the Avengers and about Mockingbird specifically. In this event-crazy medium, it’s kind of nice to have that split. Let’s keep it going. This entry was posted on 07/22/2011 by ravenhaired. It was filed under Comic books, Female Characters / Creators, Reviews and was tagged with Brian Michael Bendis, Captain America, Ed Brubaker, Marvel, Mike Deodato Jr., Steve McNiven. Did YOU read Captain America #1? To be fair though, Captain America # 1 is a very good read. Brubaker has an amazingly good handle on the character. The pacing is superb. And the art from McNiven is gorgeous in both a technical and creative sense. I can see why you enjoyed it, as I did as well. Are you going to check out Captain America and Bucky when it comes out on the 27th? The preview for it over at CBR looked quite good. As one of the many people who became a Bucky fan during Brubaker’s run, I think it’s cool that despite his horribly executed “death” in Fear Itself, there’s still an opportunity to read about his adventures. I was debating checking out Captain America & Bucky but wasn’t entirely sure. I looked at the preview now, though, and I think it’s definitely coming home with me. Looks really good. Thanks for the link!